"Congress failed the test in 1991 with Anita Hill," the Washington Democrat said Sunday. 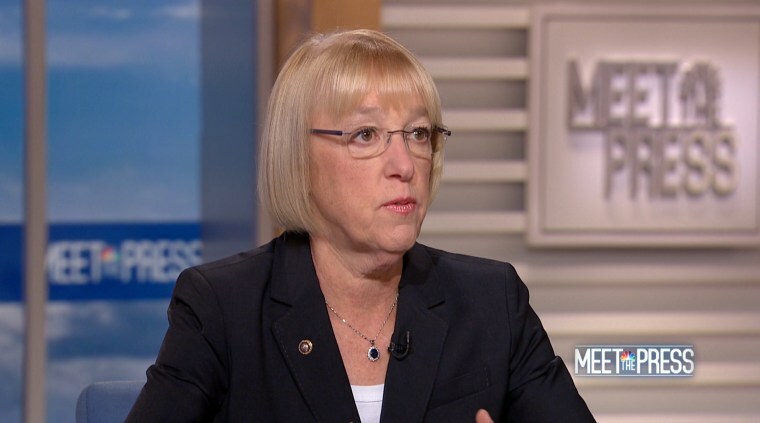 WASHINGTON — Sen. Patty Murray, D-Wash., cautioned Senate Republicans that their handling of the sexual assault allegation levied against Supreme Court nominee Brett Kavanaugh will be a defining moment of the #MeToo movement. Appearing on NBC's "Meet the Press," Murray drew parallels with the sexual harassment allegations levied by Anita Hill against then-Supreme Court nominee Clarence Thomas nearly three decades ago, questioning whether the Senate had learned any lessons. "Congress failed the test in 1991 with Anita Hill, that they could deal with this kind of allegation. And they have to be able to deal with this kind of allegation if we are going to be putting people on the highest court in the land," said Murray, a member of the Democratic leadership. "How the Senate handles this, and the Senate Republicans handle this, will be a test of this time — of 2018, in the #MeToo movement, can we do better? And I feel we are failing that if we cannot do it correctly." Kavanaugh's confirmation has been roiled by the allegation, which publicly surfaced earlier this month, that Kavanaugh sexually assaulted Christine Blasey Ford while they were both high school students in the Maryland suburbs. Ford initially levied the accusation in private to Democratic lawmakers in California, where she now lives. But she went public earlier as reports of her accusation began to trickle out. Kavanaugh has categorically denied the allegation and the White House has defended its nominee. President Donald Trump on Twitter characterized the accusations as part of an "assault by radical left wing politicians" who "just want to destroy and delay." He went on to shed doubt on her claim of sexual assault by arguing that "if the attack on Dr. Ford was as bad as she says, charges would have immediately been filed with local Law Enforcement." After days of protracted and publicized negotiations, it appears that Ford will testify in front of the Senate Judiciary Committee this Thursday. Three sources told NBC News Saturday night that a tentative agreement had been reached, but that the specific details surrounding the testimony had not yet been finalized. Murray expressed frustration at the rhetoric coming from Senate Republicans — quoting Majority Leader Mitch McConnell Friday saying that the Senate will "plow through" the confirmation process, and briefly mentioning Sen. Dean Heller, R-Nev., calling the allegation a "hiccup" without specifically naming Heller. "If someone said, 'my car was stolen,' you don't presume they are lying. But if someone says, 'I was sexually abused,' people today sometimes presume they are making it up," she said. And she lamented the lack of an FBI investigation into Ford's accusation, arguing that "Senate Republicans have predetermined the outcome, that this will be a he-says, she-says situation." Sen. David Purdue, R-Ga., defended Senate Judiciary Committee Chairman Chuck Grassley's handling of the allegation in an interview with "Meet the Press." "There is absolutely no rush to judgement," he said to NBC's Chuck Todd. "I think any objective person, Chuck, looking at the way Senator Grassley has handled this, they would walk away thinking that he has done everything he can to make sure that this information comes before the Senate and that this person is treated with all the respect she is due." He also pointed to denials by Kavanaugh and statements by other potential witnesses who have said they have no knowledge of any assault to argue against the characterization that there's no other evidence outside the accusation and denial by Ford and Kavanaugh respectively. "I hope that we will get to the truth — I think that's what the American people deserve," he said. "This is a democracy. We have a judicial system, but we also have innocent until proven guilty."